Going to the UC Davis Ann E. Pitzer Center for a concert, or for class, most music patrons and students wouldn't know that the impressive 399-seat hall and classrooms never would have broken ground without a $1 million inaugural gift of a Davis family who loved music. That happened in 2008. In bad times and good, Grant and Grace always had music, and exposed their children to music. So that others might have music too, the Nodas, along with their daughters, Kathy Miura and Tanya Yan, gave that inaugural $1 million to the UC Davis Department of Music in 2008 to enable the beginning of a concert hall. It was at that time the largest gift the department had received. Flash forward to 2016, the Pitzer Center was able to open its doors thanks to the additional gift of $5 million, a sum bequeathed by Ann E. Pitzer, an alum, and other gifts. The lobby of the recital hall is now named for the Noda family. Grace Noda, 98, passed away a few months ago, surrounded by her family, "and music" a story by Department of Music Events and Publicity Manager Phil Daley says. Grace’s generosity throughout her life took many forms. Going to a university was one of the only permissible reasons to leave an internment camp and Oberlin was one of the few universities to accept Japanese students. In 1943, Grace escorted and supported her sister, Alice, at Oberlin’s Conservatory of Music. Alice studied piano performance there and went on to lead a professional career of piano playing. In September, 2016, Alice played for Grace and others at the dedication ceremony of the Ann E. Pitzer Center, along with UC Davis faculty members. 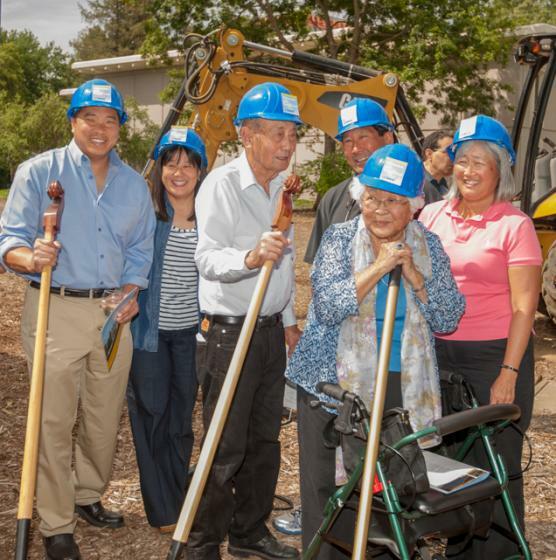 The Noda family (Grace Noda in front) helps break ground at the site of the Pitzer Center (May 2, 2014).